Robust, high value microplate reader designed to deliver research-grade results to any laboratory. EMax® Plus Microplate Reader benefits include, 8 filters for a variety of assays (covering visible range from 405–750nm), a compact instrument footprint, pre-defined protocols with SoftMax® Pro Software, and walk-up usability. 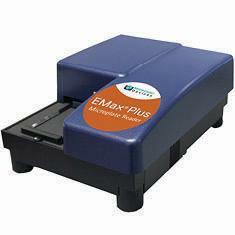 Standard features on the EMax® Plus Microplate Reader include the ability to measure both flat and round 96-well microplates, automatic lamp calibration prior to each reading (ensuring automatic measurements), powerful curve fitting protocols and statistical analysis tools, and integrated instrument control and data analysis with SoftMax® Pro Software. The software enables data visualization in 3D plots, gray scale, kinetic curve fits, and IC50 determinations. In seconds, users can set up the reader with pre-defined protocols and run samples. With 8 standard filter modes that cover the entire visible range, walk-up usability, and SoftMax® Pro Software for data analysis, getting started is now simpler than ever. Ordering information: The EMax® Plus Microplate Reader includes; 8 filters for a variety of assays (Bradford: 595nm, BCA: 562nm, Lowry: 650nm, MTT: 570nm, XTT: 492nm, Cell Density: 620nm, PNPP: 405nm, DPD: 492nm, TMB: 450nm), a current version of SoftMax® Pro Software, user manual, and one-year warranty covering parts and labor.